I bought this reciever new 20 years ago. I've used it as my home stereo. I used in the garage for years. I put in a box for several years. A few weeks ago I decided to get a turntable after years without one. I paired it with this reciever and a pair of Sansui floor speakers. Sounds awesome!! I have zero regrets about this 20 year old purchase. If you want to spend $25 on this thing at the thrift store and then go online to complain about it, just punch yourself in the face instead. I bought this receiver from a local Salvation Army Thrift store 2 days ago for $35. I was definitely a bit skeptical, considering $35 was a bit on the pricey side for a 17 year old appliance with no guarantee or even redeemable store credit if there was something wrong with it. I knew I was taking a chance but I just went with it on a hunch. I noticed the power consumption was 190 watts, so I figured it must put out sufficiently more power than my 40 year old Marantz 2220 that I was looking to replace. I was on my way to work and couldn't wait to find out some information on it. So when I got there I asked a co-worker to Google the receiver on her phone. It said it had 100 wpc. "Wow!, " I said. But wait a minute, I thought, something's not right about those numbers. They're too freakin' high! I thought, there's no way that thing is REALLY putting out that much power. Maybe when I get home I can Google it myself and find out what the REAL power numbers are. You know, that's what I hate about these modern day hyped up power ratings, they're so dishonest! I would be surprised if this unit maxed out at 100 wpc. The real, old school "RMS" power rating is probably more like 50 wpc, I thought. So here's what I found out: THE REAL RMS POWER RATING IS 40 WATTS PER CHANNEL. So there you have it. Am I disappointed? Not in the slightest. 40 watts per channel is TWICE THE POWER that my old Marantz 2220 (20 wpc) puts out. Also, the total harmonic distortion (THD) on this receiver is only .09%, where as the 2220 has .9% THD. So it was a hell of an upgrade for only $35. For crying out loud, I paid $50 just to have that old Marantz professionally cleaned! And it still has a slight background "hiss" to it. What else can I say here? I can't complain. Oh yes, and by the way, this Pioneer performs FLAWLESSLY WITH NO ISSUES WHATSOEVER, EVEN THOUGH IT IS GOING ON 17 YEARS OLD. That should tell you something right there. You know, I've always been partial to Marantz (I own 4 of them), but Pioneer is slowly but surely earning a prominent place in my collection. Very colored amp. Cheap is the one word that comes to mind. Cheap price, cheap sound. Tinny highs, thumpy bass. There you have it. The sound is just plain bad. Bass is good, but the mid and high ranges are complete s*^t! The treble knob controls the wrong frequency range. The receiver lacks clarity. Pioneer really should have stuck with the 5-band EQ models. I had a 5-band 50 watt Pioneer receiver from about 1991 that was wonderful. This amp is just pathetic! I even went out and bought a high-quality EQ to try and salvage the money I spent on this receiver. Even that could not improve the sound. I finally faced the fact that I wasted my money! 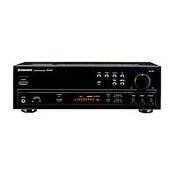 If you don't have a good ear, then this receiver is poerfect for you. But, if you can tell the difference between the sound of an oboe and the sound of a flute, then don't buy this piece of junk. The Pioneer SX-205 is an outstanding value for the money. It is not an audiophile reciever. It is an entry level product for people who want a lot of power for little money. In that regard it does its job very well. It"s drawbacks are its bass response, loudness button[super bass-it makes the bass louder while adding noticeable distortion]and the lack of high and low filters to tweak the tonal characteristics of it"s output. This is one very colored amp. I found it to sound HORRIBLE but very loud. I bought it to play back mixes in my studio's rehersal room but found it totally unuseable. The stereo separation is very bad also. I tried it with 3 other speaker pairs and my results were the same. I was using an old Pioneer sx-580 though B+W 601 speakers. I love to listen to my stereo. With this reciever I can listen to my speakers really loud for a very cheap price. It is a great reciever for someone who has 2 speakers. But for a person who has a whole home theater I would not recomend this reciever for them. For a hundered watt reciever you would have to really shop around to find one that is this cheap. Pretty good FM reception with outdoor antenna. improvement for the radio listener. get an upgrade on the ceramic filters, and see what happens. For now I am satisified with the SX-205.